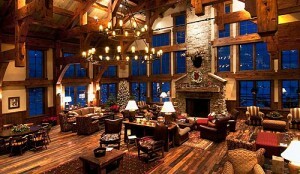 A relaxing yoga session sounds great anytime, but it’s even better in a setting as lovely and peaceful as a dude ranch. And since horsemanship is at the crux of Colorado’s C Lazy U Ranch experience, C Lazy U is offering for the second year its unique combination: A yoga and riding program. It’s called The Julie Goodnight riding and yoga retreat for women (that’s Julie at right). Located at the headwaters of the Colorado River and in the shadow of Rocky Mountain National Park (just two hours from Denver International Airport), C Lazy U is a true retreat from the stresses of everyday life. 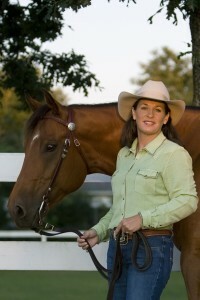 In cooperation with Julie Goodnight, the riding and yoga clinics take place May 18-21 and October 19-22, 2012. The internationally-respected trainer and clinician, Julie Goodnight, teaches riders how to be their horse’s leader and master their equestrian skills through understanding horse behavior. C Lazy U’s clinic is developed for riders of all levels, from beginners to advanced riders. In tandem with the riding program, attendees will also enjoy yoga from instructor Ellen Mesaros, teaching Anusara yoga. In their free time, participants are encouraged to indulge at the “Lazy U” spa for world-class massages, facials and more. 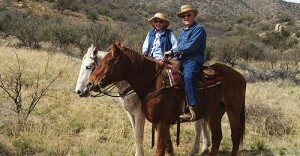 The ranch will also offer a ranch riding adventurefor adult riders of all levels September 21-24, 2012, also in cooperation with Julie. All three weekends feature discounted rates for world-class accommodations with programming, riding, and yoga (during the yoga weekends) included. Some participants will bring their own horses and others will work with one of the Ranch’s 175 horses. A sample itinerary 7:30 Breakfast, open seating; 9 Group One: Riding lesson; Group Two: yoga; 10:00 Break 10:30 Group One: Yoga / Group Two: riding lesson; 12:00 Lunch 1:30 Group One: riding lesson; Group Two: trail ride or free time;3:00 Group One: trail ride or free time; Group Two: riding lesson; 5:00 Yoga stretch for everyone; 6:30 Cocktails; 7:00 Dinner is served! 8:00 Horse talk around the campfire. Details: C Lazy U offers a selection of 38 rustically-elegant cabin accommodations. All guest rooms boast beautifully-crafted western and southwestern style furnishings, and most feature stone fireplaces, refrigerators, sitting rooms, balconies, and some, a jetted tub. For more on C Lazy U, visit Ranchweb. 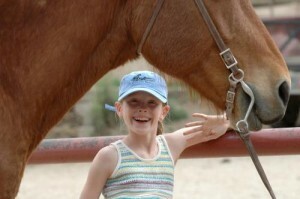 Elkhorn Ranch, located in the rugged Baboquivari Mountains southwest of Tucson, Arizona, is a traditional family owned and operated guest ranch offering horseback riding and comfortable living for about 32 guests. The Miller Family has owned and operated Elkhorn continuously since 1946 and enjoys the friendship of many returning guests and crew. It is family owned and operated, so you get that feeling of family hospitialty, too. which may account for all those rave reviews. “We have a lot of loving return folks,” Miller notes, “and people enjoy the comraderie of friends they make and return to visit here. But its wonderful to get new guests, too!” Miller adds. And about that riding focus? “All of our rides are guided. 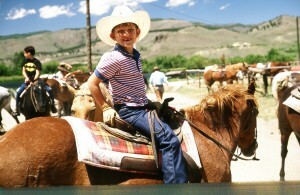 Our horses are ranch raised and trained and only used here. They have summers off and we have a large variety of horses (and saddles) to match people’s abilities,” Miller contends. And rides here are kept small, with each one arranged for your needs and what you want to do. “It’s been a lovely spring,” Mary reports. “The cactus flowers are blooming and the mares should be foaling toward end of the month.” But don’t wait too long to decide to visit. “We close at the end of April, so call soon to hold your spot or try for next season (from mid-November to end of April)!” Thanks for the update, Mary! 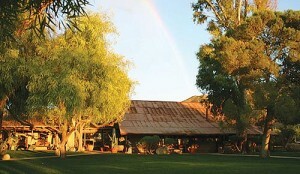 Details: Elkhorn Ranch’s twenty cabins and Long House where you gather for meals are tucked amidst the mesquites of Sabino Canyon, surrounded by mountain views and the wide open Altar Valley. The cabins provide comfortable living for singles, couples or families, each with a private bath, electric heaters, good reading lights, a sitting area, and your own birdfeeder with unlimited birdseed. No phones or televisions in the cabins. Daily housekeeping and nightly bed turn-downs. They’re happy to take care of special needs. 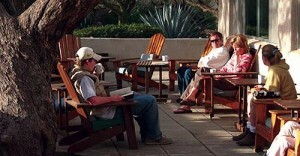 Check Ranchweb.com for details.